The government’s definition of “Houseless Households” covers families that do not live in buildings or “Census houses”, but rather in the open — by roadsides, on pavements, in “Hume” pipes, under flyovers and staircases, on railway platforms, and in the open at or near places of worship. Between the two Censuses of 2001 and 2011, the numbers of these houseless households remained virtually unchanged in India — growing a mere 0.5% from 4.47 lakh to 4.49 lakh. Urban India, however, showed a 36.78% growth — from 1.87 lakh to 2.56 lakh households — during this same period, while rural India showed a negative growth of 25.73% (falling from 2.59 lakh to 1.92 lakh households). “This disparity in rural and urban areas is a direct impact of the social assistance schemes that have been launched by the government. Most of these schemes are meant for rural areas, and are not as easily available to the urban poor,” Mohammed Tarique, coordinator of Koshish, a Tata Institute of Social Sciences (TISS) Field Action Project on Homelessness and Destitution, said. Many of those who live on the streets are also economic migrants who have moved from villages to cities in search of employment. While many do get a job, getting a house is often difficult — and they end up sleeping on the streets, Tarique added. Interestingly, even as the number of homeless households increased, the average size of these households shrank between 2001 and 2011, suggesting that some individuals might have abandoned their families, or drifted away from them. In 2001, the family size of a homeless household was 4.34 in India — 4.48 in rural areas and 4.14 in the cities. In the latest Census, the numbers went down to 3.9 for India, 4.3 for villages, and 3.7 for cities. The country’s total homeless population, however, came down from 19.43 lakh to 17.73 lakh between the two Censuses. While a large number of states showed a fall in the numbers of homeless households, several big states showed an increase — Jharkhand (139.2%), Delhi (130.8%), Uttar Pradesh (68.3%), West Bengal (47.9%), Jammu & Kashmir (44.32%), Bihar (41.4%), Rajasthan (37.3%). Not all those who are homeless are classified as beggars or destitutes. 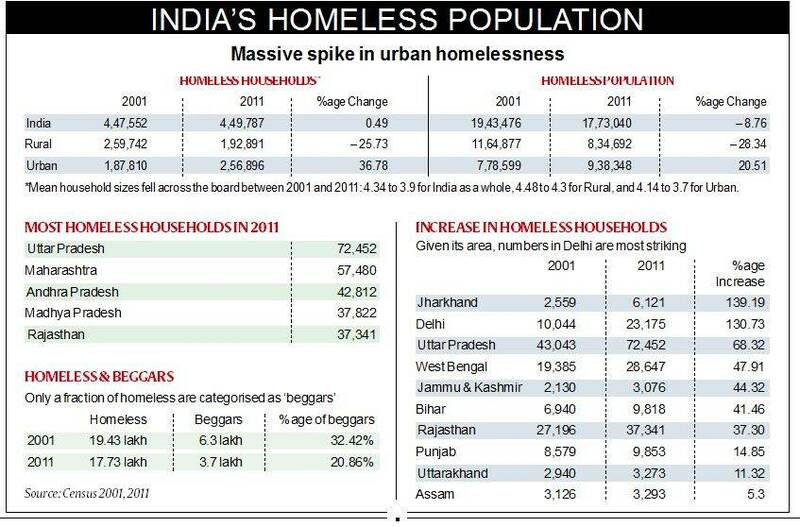 Of the total 17.7 lakh homeless population recorded by the 2011 Census, only 3.7 lakh — or 1 in 5 individuals — were classified as beggars and destitutes. The remaining are either migrant workers with no home, or nomadic tribes who ply their trade on the streets. The law, however, categorises all those who live on the steets as beggars. And beggary is illegal — and punishable by a jail term of 3-10 years. The statute against begging has been coded in the Bombay Prevention of Begging Act, 1959, which has been followed by almost all states. Activists say the Act provides no clear categorisation of beggars, and clubs homeless migrants and landless labourers with beggars. Under the anti-begging law, which is based on an archaic British law against vagrants, anyone with no visible means of subsistence and found wandering about in a public space is deemed a beggar. All those who solicit alms in a public place through singing, dancing, fortune-telling or street performances, too are deemed as beggars. The Act gives discretionary powers to police to pick up anyone on the hunch that he is a beggar or destitute with no means of fending for himself. Recognising that the law criminalises the poor and those suffering from mental ailments, rather than rehabilitating destitutes, the central government last year finalised a draft Persons in Destitution (Protection Care and Intervention) Model Bill, 2016. The draft law seeks to “provide for the protection care, support training and other services to all persons in destitution”, and refers to destitution as a state of poverty or abandonment arising from economic or social deprivation including age and infirmity, homelessness, disability and sustained unemployment.